HOUSTON — NASA astronaut Mark Kelly has a lot on his mind. The commander of the space shuttle Endeavour is engaged in a busy day in orbit while knowing his wife, Rep. Gabrielle Giffords, is undergoing brain surgery today (May 18). Despite the potential for distraction, NASA officials say they aren't worried about Kelly's ability to focus on the mission at hand while Giffords undergoes surgery. "Mark's been unbelievably performing on orbit," said lead shuttle flight director Gary Horlacher after Kelly parked Endeavour at the International Space Station today. "If you didn't know any of that was going on, you wouldn't have any idea." Today's procedure is cranioplasty surgery expected to aid in Giffords' overall recovery. 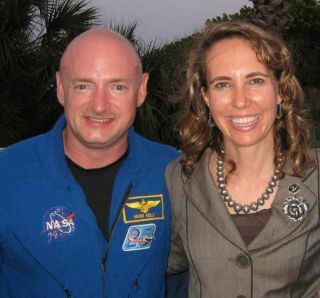 It may be awkward timing, but the surgery was planned for whenever Giffords was deemed ready, regardless of events beyond planet Earth, Giffords' chief of staff, Pia Carusone, told reporters Monday (May 16) after Endeavour's launch. While Kelly has been focused on the activities required to dock and settle in at the space station today, NASA said a team of flight surgeons has been keeping him updated on his wife's progress. "Those kind of things are going on in his personal life, but he's doing great," Horlacher said. "I know that the surgeons are keeping him informed appropriately." Kelly has had lots of practice compartmentalizing his feelings — it's what he was trained to do as a Navy captain with 39 combat missions under his belt. Kelly himself said that he would have to rely on this skill during the shuttle mission, and he said he proved to himself he would be able to do it by returning to training for the flight less than a month after the shooting. "You learn to separate the mission from things that might be going on in your personal life," Kelly said in February. "I've been doing that for 24 years."